We have lots of things to do in Marmaris. You can check other popular tours. 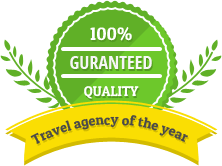 Muyara travel has been a trusted name in tours and travels since 1997. It started from bits and has today grown into a full-fledged tourism agency. We take care of your visit, travel and stay in Turkey. We offer individual as well as group tours from Marmaris to Icmeler and Turunc. Also, we provide airport transfer from Dalaman and Bodrum airports to Marmaris, Icmeler and Turunc. Online bookings for Marmaris excursions can be done from our website www.excursionsmarmaris.net . By booking your tour online you save yourself from paying double amount to hotels and guides. Also, online bookings enable you to come to Marmaris all prepared as you do not have to search for agencies or hotels after reaching Marmaris. This saves your precious vacation time as well as relives you of the stress of tour planning. Therefore it is always a better option to book Marmaris excursions online and we will take care of all your tour planning. There are various payment options through which we accept the payments. You can choose any option as per you convenience. Pay on the day: This is a last minute payment. By choosing this you have to pay for the services on the spot or on the day of the tour. There is no advance payment required in this option. You can avail his offer even by booking online. While you book from our website, you just have to make the tour reservation and do not pay. You can pay when you arrive to Marmaris. Pay by PayPal: PayPal is an international payment method and is very secure too. By using this option you have to pay 10% of the amount by your PayPal account. The card and account details will never be used or saved by us. If you wish to cancel your tour, you can do so anytime and all the amount will be refunded back to you. When you hear Turkey, beautiful beaches and natural scenic locations flash your mind. But Turkey is not just that. There is more to add to it. The history and evolvement of Turkey is worth knowing. For this taking a local trip to the regular city market and knowing the local life here is required. We at Muyara Travel offer this tour where you can move around in the city and mix with the people, talk with them and learn about Turkish developments over time. You can visit beautiful mountains, beaches and also go on full day tours and different safari tours in Marmaris. To get details of different things to do in Marmaris visit our website www.excursionsmarmaris.net . 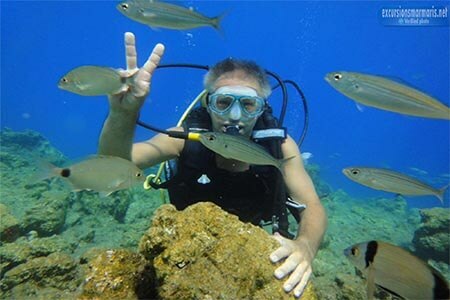 You can find different categories of activities to do in Marmaris. These activities are historical tours, night tours, kids friendly and so on. By booking your tour online pre hand you can plan the entire trip to Marmaris without wasting a second of yours on arrival. Also, we just don’t make reservations, we are available 24×7, to assist you, direct you and help you during your entire tenure in Marmaris. City limited tours: There are many local excursions is Marmaris. These tours take place within the boundary of Marmaris. If you are on the planning to go to Turkey, We suggest you to visit Marmaris. The best places with a plenty of premium services you can find. We are the Muyara Travel want you to underline some of the attractions of Turkish. No other good satisfactions when you don’t experience the most joyful bathing in Marmaris. Well, you are on the best place of bathing service in Marmaris which you can get a complete perfect tan. The Turkish bath which used to open for rich people now is enjoyable for everyone who desires. If you have just touched down Hamam, we are the most recommended place to visit to relax your body through our treatment. We provide you the best service including picking you up from the hotel. By then you enter the room, You will be given a sarong which you can wear with the swimsuit. Perfectly, walking with your plastic slippers and enjoy the steamy room. Other services you cannot find in other bathing places are the message, gentle press on your muscles and the warm room which make you so relax. Your next destination will be more fun for a great view in the unspoiled villages, waterfalls, beach and pine-scented forests. 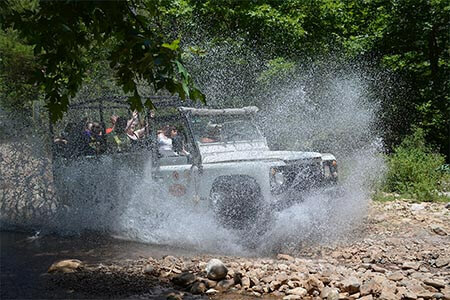 Get your wonderful trip with the jeep safari. It just takes 22 minutes from Marmaris. If you are the one who really love riding a horse, you are on the right place. We can provide you a well-behaved horse you can pick. All you need to do is just sitting on the saddle and enjoy your meaningful journey. If you have kids with you, ensure that you will accompany them. Once you have been pampered on a super fun day, let’s go to the night show where you will find so many night shows. It is strongly suggested to you to go. You can find the beautiful of belly dance, Turkish food and wine, and the Turkish folk dance. Well, visiting a place like Marmaris is satisfied when you don’t find any waterpark to have fun all day long. 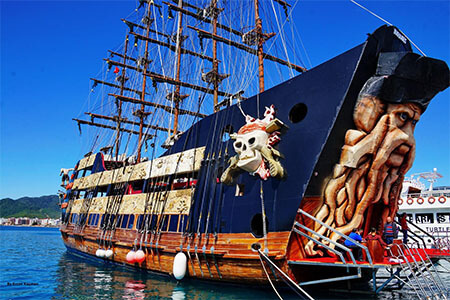 Enjoy your fun with the family in Marmaris with a full of attractions you can join and see. A number of games are provided to you; kids pool, mini golf, bowling, restaurants, bars, numerous slides and many more. 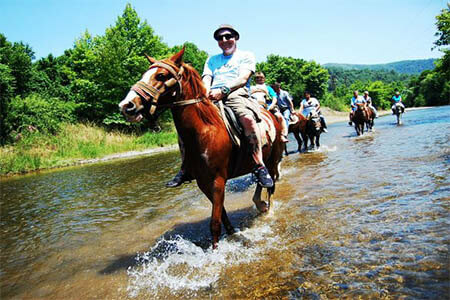 Well, visiting Turkey is not only about something, but you experience each of the fun! Call us! 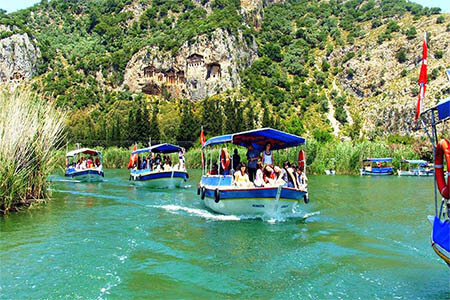 Feel the natural beauty of Marmaris by going on nature tours to below locations. A professional guide will accompany you on these trips to give you all details of the location and its history. Well, never forget to bring your camera, swimming wear, towels, a pair of comfortable shoes and for sure some money. 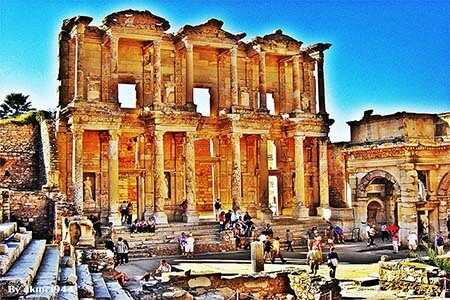 Take your best picture in the Ephesus where its will bring you back on the gladiator session. The ancient greek is under your feet. As the most suggested place in Turkey, you will need around 1-1,5 hours by flight or 9-10 hours from the Istanbul using land transportation. We suggest you to take the land transportation instead as you will get the beautiful scenery you cannot find in each place; green hills, sheep and this smooth long road will never make you forget the place once you leave. One of the seven wonders of the Ancient world is the Temple of Artemis in which has valuable things you can keep in a picture. You can find the Library of Celsus and the biggest ancient stadium, you may call it like that as this can accommodate 24,000 of people. 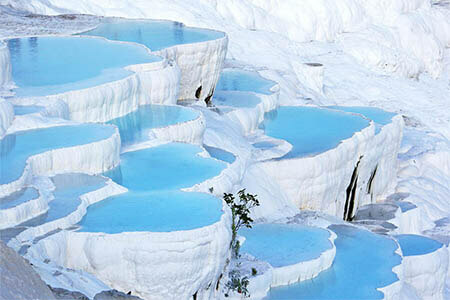 Taking Pamukkale tour needs 4 hours from Marmaris. This place offers you the greatest mountain with white calcium covering mountain since thousand years ago. It is worth when you look around. Here you will find the Cleopatra’s pool with calcium cliffs along with the Hierapolis and Nicopolis. Another trip choice after visiting Marmaris is the Rhodes Island which only takes 45 minutes. Thi beautiful island offers you some historical places like St Paul Church, Museums, Aphrodite Temple, Grand-Master’s Palace etc. We suggest you to bring a camera, sun block, sunglasses, and Passport. About 10-15 minutes you walk away from the harbour, you can find a number of local shops, leather goods and the famous ones are Marks and Spencer. Also, you still can enjoy your Greek cuisine in the restaurants surrounding or some fast food if you like eating on the go. For one more natural view, you just can go on the Dylan around 60 minutes. It’s pretty much worth it for you who just want to enjoy the untouched busy life. This place is well-known as the turtle beach completed with the golden sand. Taking a boat to Koycegiz will be the unforgettable moment. Breath the hot spring and taste the mud! What makes people so interested to visit Turkey is the sea. Instead of going by flight, this moment has never been passed when the sea always calling tourists to go sailing. We offer you the exclusive boat trip you can book privately. Have fun with someone special with our complete facilities including sunbeds, toilets, masks, a bar along with all of the machinery and stuff needed. The special destination is for private trips with seven bays to visit. No worries of the hungry, we serve you on the boat to give you the best feeling eating in peace. We will ensure that your money will worth with the service we give to you. The private boat trip is designed not only for a personal consumer but also, a special event is allowed. Birthday or a romantic trip is possible. You can order what you need and arrange it as you want. Our tour will begin with picking you up on the Marmaris hotel, Icmeler and Turunc. By then the tour os over, we can drop you back at 5:30. As we promise to you, our boat trip offers you to the best island in Turkey. One of them is the Aegean Island. This lonely island is ready to pamper your desire of calm and sunny atmosphere. Do note that yo are ready with the camera everywhere. You cannot ignore the scenic bay in Hisaronu Bay which speaks a lot about the ancient Greek. Meanwhile, our guide also will let you know the history in this place. Who can ignore the beauty of Cleopatra Island? Yes, everyone loves the white sand smoothly outspread in the beach taking millions of years for the tiny sand- just like the empty seashells to form such kind of sand. You cannot take any sand before leaving, or even use a towel in the beach as it is sticky to it. Historically, this place was used for a special meeting with her lover, Mark Antony. people cannot explain how smooth the sand is if you don’t walk barefoot on it. What a gorgeous! There is nothing you can compare to this small paradise. It is a peace of heaven you should go. The water here is not just good for swimming and sailing. It is great for water adventure sports too. We offer below trips which are full of fun and extreme sports. Going to Turkey is perfect if firstly you destine to Marmaris. Yes, for you who love diving, it is the best place you should visit in which a friendly sea supporting you even you are a beginner. If you are the beginner, we will ensure you getting the instruction about the equipment. Besides, a safety and the sign-language are included. By then, a breathing exercise is taken both on the surface or underwater. We need to ensure the beginners are confident enough to dive safely after such a training. Also, we only let the beginner dive only 6 meters only. It is enough and clear though for seeing the beauty of the sea. Meanwhile, the certified divers can enjoy their diving experience according to the certificate. 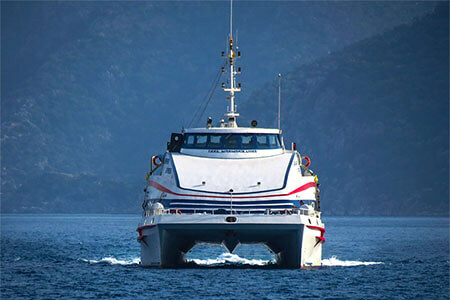 Our Marmaris boats drive you to get the best spot for diving. If your family cannot enjoy the diving time, they still can have fun with facilities we provide. Ensure you and your specials bring the swimsuits, towels and sun cream. It is not enough before you go on the quad safari! Leave your thought about being stuck in the mud or something! Feel free to join this funniest trip and lot of heart rush. Get muddy, get wet and get dusty! It is suggested to bring your old clothes if you don’t want to ruin your holiday of being regret getting your good clothes torn. Besides, we always ensure our customers with the complete equipment for a safe adventure. It is included the procedures of using the quad bike and healthy and safety rules. Just Make a little fun and get muddy! Then now it is time for pumping your adrenalin after various adventure we have mentioned above. Get some wet with a rafting challenge in Marmaris. At the beginning, before you go rafting, our guides will explain the safety trip and the right procedure you should do. Once you have done, they will divide you in some groups and the rafting is begun! At first, it is calm and smooth which is the right time for you to learn. By then, you will have fun with it! Keep in mind you don;t forget your old clothes, shorts, pocket for beverages, shoes and sunscreen, also your own medicine you need privately. Get the unforgettable adventure with us. There is no excuse to ignore this! We are the Member of TURSAB.